NEW YORK (CNS) — Elie Wiesel, a Holocaust survivor, Nobel Peace Prize recipient and prolific author who died July 2 at age 87 in his New York home, has been remembered in tributes from around the world for standing up for human dignity and for being a witness to the world of the atrocities of the Holocaust. When Pope Francis received the Charlemagne Prize May 6 for promoting European unity, he quoted Wiesel urging Europeans to undergo a “memory transfusion,” to remember their fractured past when confronting issues that threaten again to divide it. That sentiment has been echoed by many. He said his friend Wiesel “had seen the depths of the darkness that we are capable of inflicting on one another” and his belief in the “the fundamental goodness of humanity,” despite this knowledge, was all the more inspiring. He accepted the award with a stern call that all who witness suffering and humiliation must take sides. “Neutrality helps the oppressor, never the victim. Silence encourages the tormentor, never the tormented,” he said. Wiesel is most known for “Night,” his autobiographical account of the horrors he witnessed in concentration camps as a teenager. It was published in 1960. When he was 15, the Nazis sent him and his family to Auschwitz. His mother and his younger sister perished there. His two older sisters survived. He and his father were later transported to Buchenwald, where his father died. 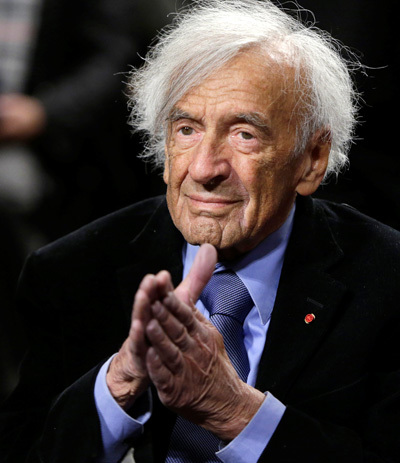 “Never shall I forget that night, the first night in camp, which has turned my life into one long night, seven times cursed and seven times sealed,” Wiesel wrote. The small volume, just over 100 pages, was initially something publishers were not sure would sell and is now required reading for many U.S. students. The Catholic French author Francois Mauriac encouraged Wiesel to write the book, breaking his silence about his experience. The work not only is an account of what happened but a reflection on faith and God’s presence amid unspeakable horrors. Wiesel was born Sept. 30, 1928, in Sighet, a small village in Romania. In 1963 he became a U.S. citizen, and six years later he married Marion Rose, a fellow Holocaust survivor who translated some of his books into English. The couple had one son, Shlomo. Wiesel was not only involved with the museum and with writing but he also taught college courses at Yale University, Boston University and the City University of New York. When the U.S. Holocaust Museum opened Jewish and Catholic leaders said it not only recounts the deaths of millions of victims of World War II, but it presents a lesson for all people. “It tells a crucial story, summing up the underside of the 20th century,” said Eugene J. Fisher, who was the associate director of the Secretariat for Ecumenical and Interreligious Affairs of the National Conference of Catholic Bishops.